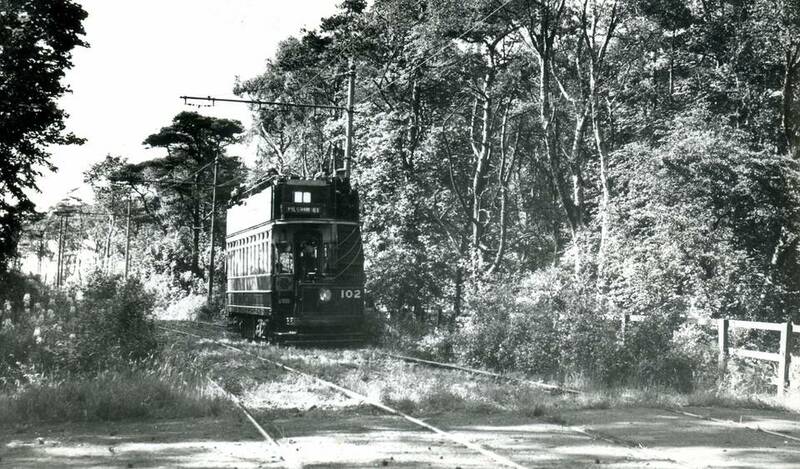 Newcastle 102 has been described as a tram that should never have been built at all; and its current guise is a product of evolution and adaptation rather than conscious design. The original concept dates back to the early days of tramway operation when several North American tramways operated fleets of summer and winter-bodied tramcars that often shared the same trucks and equipment. This idea evidently appealed to Newcastle Corporation, which ordered from Hurst Nelson of Motherwell in 1901 thirty single-deck open-sided tramcar bodies with clerestory roofs that could be placed in summer on the bogie trucks of some of their saloon single deckers. The original design of these bodies – known on the Continent as ‘jardinière’ – consisted of normal end platforms and centre gangways, but very low side panels that were equipped with roller shutters for use in bad weather. Unfortunately, the bodies were delivered in the late summer and autumn of 1902. This was too late for them to be used that year and, while waiting for the next summer season to arrive, the transport committee appear to have had a change of heart that was no doubt prompted in part by local climatic considerations. Accordingly, they decided to rebuild the ‘spare’ bodies as open-topped double deck bogie cars. These would not only be better suited to Newcastle’s unpredictable weather, at least for lower deck passengers. but also offered much higher occupancy levels. 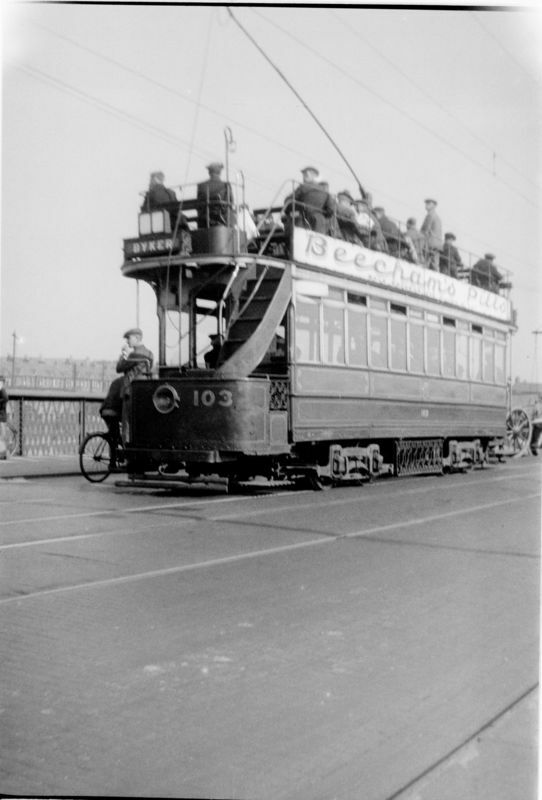 Newcastle 102 was one of the first rebuilds of the new F-class that emerged from this conversion process and, with an official maximum capacity of 84 seats plus 18 standing, it was one of the largest tramcars to operate in Britain. This increased capacity proved invaluable for conveying large numbers of dockers to work and back and also on race days. Indeed six Class F cars are reported to have moved 1,000 people on one particular race day at Gosforth Park. (No fewer than sixteen double deck buses would have been required to shift the same number). 102 in Gosforth Park. W.A. Camwell, date unknown. 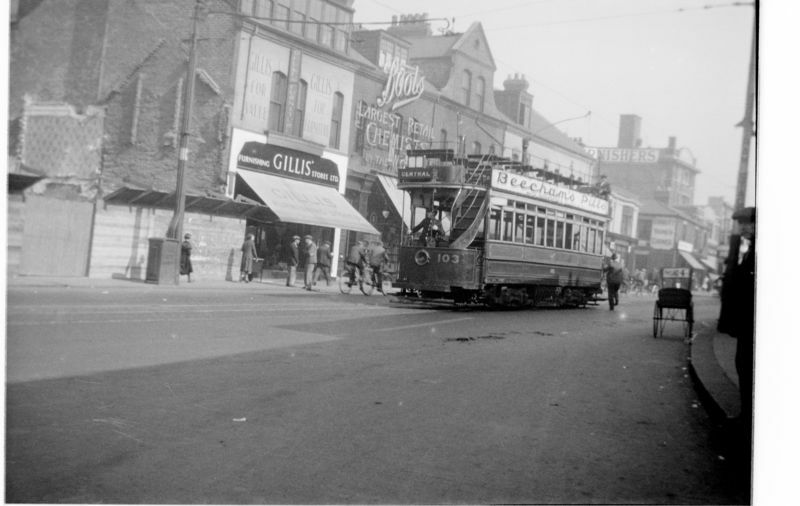 In 1916, the tramcar was involved in a ‘runaway’ accident in Byker and had to be extensively repaired. It also sustained an electrical fire in 1943, causing it to be completely rewired. Apart from this unscheduled remedial attention and an occasional repaint, the tram performed reliably for almost half a century with only a single major overhaul, in 1933, despite its heavy workload. Sister car 103. M.J. O’Connor, date unknown. 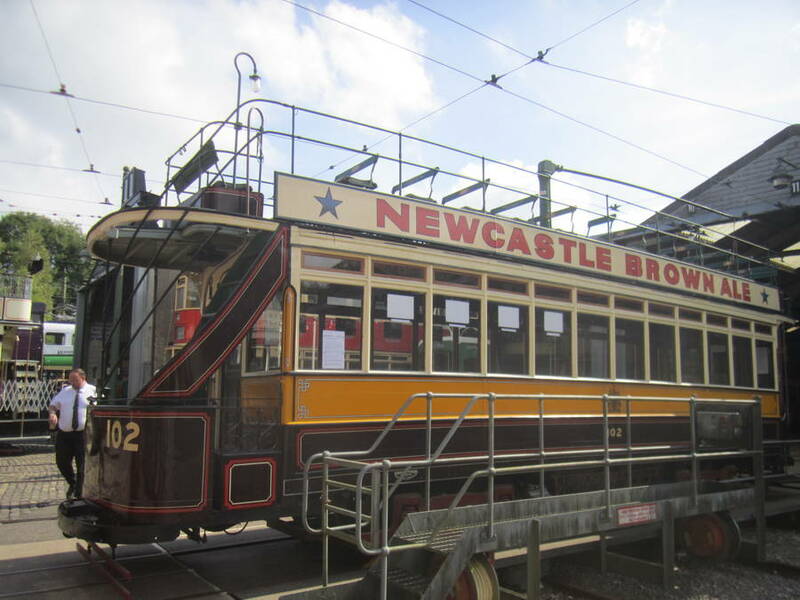 Newcastle 102 was withdrawn from service in February 1949 and acquired by the tramway committee of the Light Rail Transport League (fore-runner of the Tramway Museum Society) even though there was no dedicated storage space in which to house it. Temporary accommodation was initially provided by Bury Corporation until they needed the space to house their buses. 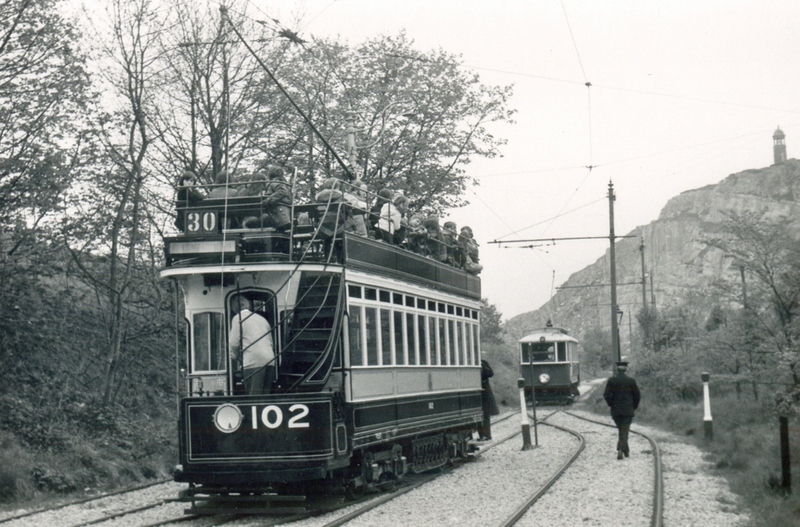 In 1958 the tram was put on display at the then Montagu Motor Museum in Beaulieu, where it proved a very popular exhibit alongside Southampton 45..
Once the Tramway Museum Society had finally acquired its own premises, the process of restoration could finally begin, but because of space constraints at Crich much of the work was done at the Byker depot in Newcastle between 1967 and 1970, when the car was moved to the museum’s off-site storage facility for completion of its restoration. It was finally brought to Crich in 1975, where it was formally launched on 21 June with the aid of a bottle of Newcastle Brown, which was broken on its bumpers, to the accompaniment of the Teversal Colliery brass band. 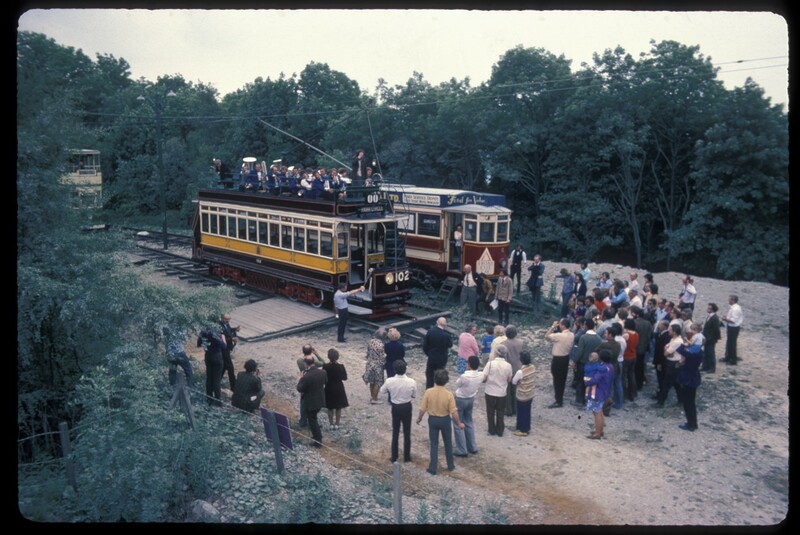 Thereafter the tramcar helped to earn its keep as part of the operating fleet (albeit somewhat sporadically) between 1975 and 2000. It paid a brief return visit to its native home town in November 1981, when it was exhibited in a transport cavalcade to mark the opening of the Tyne and Wear Metro. 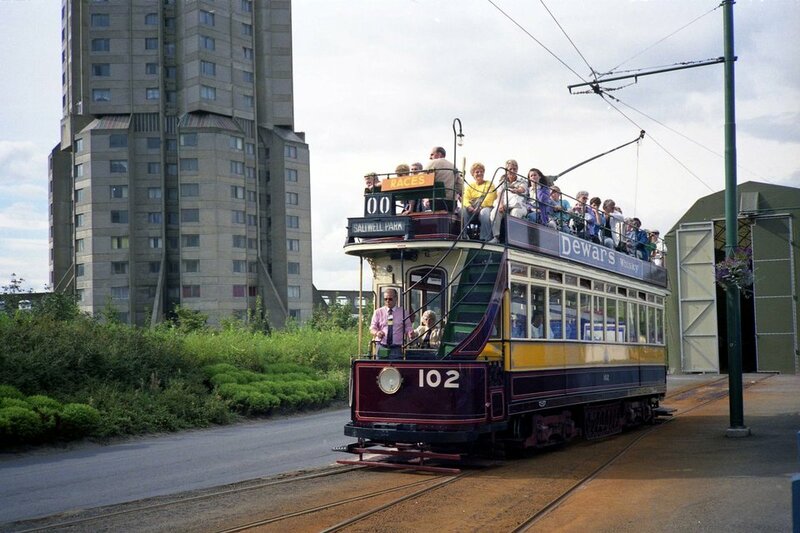 It then enjoyed a moment of glory in 1990 when it was selected as one of three Crich trams to provide a regular passenger service at the Gateshead garden festival in that year. 102 at the Gateshead Garden Festival in 1990. Richard Lomas. The tramcar was withdrawn from service with a broken axle in 2000, since when it has been on static display, firstly in the Great Exhibition Hall and then, more recently, in the depots. On 30th June 2018, however, 102 entered the workshop for a programme of extensive repair work with the aim of returning it to operational service in the not too distant future. 84 (48 on top deck; 36 downstairs with additional authorised standing room for 18 passengers in the lower deck saloon) Originally built in 1901 as a single-deck tramcar with seating for 36 passengers. Single deck tramcar bodies originally supplied by Hurst Nelson. Rebuilt by Newcastle Corporation incorporating metal components obtained from Brush Electrical Engineering Co. of Loughborough. 1903 – rebuilt by Newcastle Corporation; the single-deck body was originally open sided and built to a jardinière design. It was rebuilt as an open-topped double decker and placed on Brill 27G bogie trucks. 1933 – original hand brakes replaced by B.T.H. air brakes and B18 controllers replaced the originals. New motors were also provided to replace the original 30 hp motors. Following withdrawal no. 102 was temporarily housed in Bury before being put on open-air display in 1958 at the Montague Motor Museum in Beaulieu. 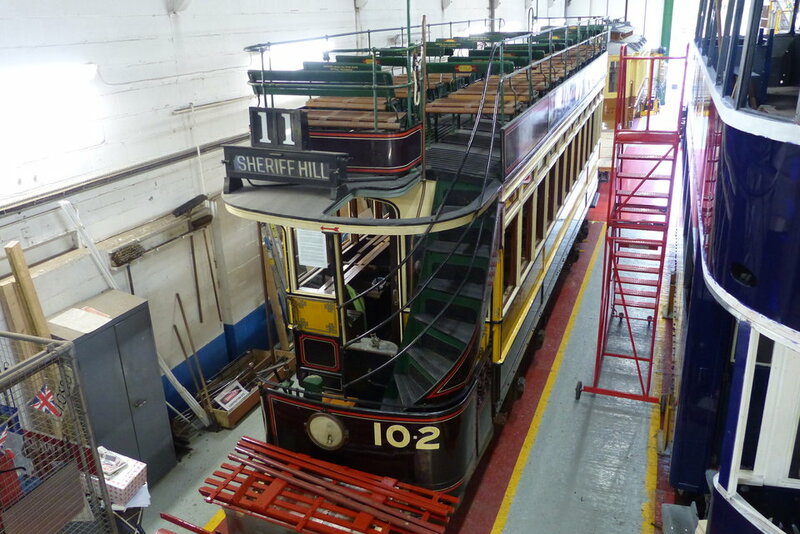 The tramcar was then moved back to its home turf at Byker Depot for restoration in March 1967, though this task was only completed after a further move to the museum’s off-site storage facility in April 1970. Its final move, to Crich, took place in 1975. Has previously been restored to operational condition but is no longer operational and further restoration is now required. 1975. Has operated in 11 seasons, most recently in 2000. 5,304 at Crich plus 1257 at Gateshead Garden Festival in 1990. Currently undergoing a comprehensive overhaul in the workshop with a view to returning it to operational condition.